Eine Gruppe brasilianischer Guarani-Indianer hat einen dramatischen Aufruf an die Regierung gerichtet und mit den Worten 'Wir fordern ein für alle Mal unsere Ausrottung anzuordnen und mit Traktoren ein großes Loch für unsere Körper zu graben', um kollektive Tötung gebeten. Der Aufruf ist eine Reaktion auf eine richterliche Räumungsanordnung, die die Guarani-Kaiowá (Pyelito Kue/Mbarakay-Iguatemi, MS) ungerechtfertigt von ihrem Land vertreiben würde. In ihrem Brief erklären sie: 'Diese Entscheidung ist Teil der historischen Vernichtung der indigenen Völker Brasiliens. Wir haben die Hoffnung verloren in Würde und ohne Gewalt auf unserem angestammten Land zu überleben'. Die 170 Indianer gehören den rund 46.000 Guarani in Brasilien an. Sie haben mehrfach brutale Angriffe erlebt, seit sie auf ein kleines Stück ihres angestammten Landes zurückgekehrt sind. Das Land hatte sich zuvor ein Viehzüchter angeeignet. Seit der Wiederbesetzung sind bereits vier Guarani dieser Gemeinde gestorben: Zwei durch Selbstmord als Folge der desasteriösen Lebensumstände und zwei nach einem Überfall durch bewaffnete Männer. Viele Guarani in Brasilien fristen ihr Dasein unter deprimierenden Umständen. Ohne eigenes Land, das sie auch bewirtschaften könnten, bleiben nicht wenigen nur die Streifen Ödland zwischen den Straßen und angrenzenden Feldern, was man bei uns vielleicht als Straßengraben oder Randstreifen bezeichnen würde. Die zuständige brasilianische Behörde für indigene Angelegenheiten FUNAI erklärte, dass sie daran arbeite, die Räumungsanordnung im Fall Pyelito Kue/Mbarakay-Iguatemi zu widerrufen. We (50 men, 50 women and 70 children) Guarani-Kaiowá communities originating from tekoha Pyelito kue / Mbrakay, we write this letter to present our historical situation and a final decision before the dispatch order expressed by the Federal Court of Navaraí MS, as Case No. 0000032-87.2012.4.03.6006, on 29 September 2012. We received information that our community will soon be violently attacked and thrown out of the riverside by the Federal Court of Navaraí, MS. Thus, it is evident to us that the very action of the Federal Court generates and increases the violence against our lives, ignoring our rights to survive on the riverside and around our traditional territory Pyelito Kue/Mbarakay. 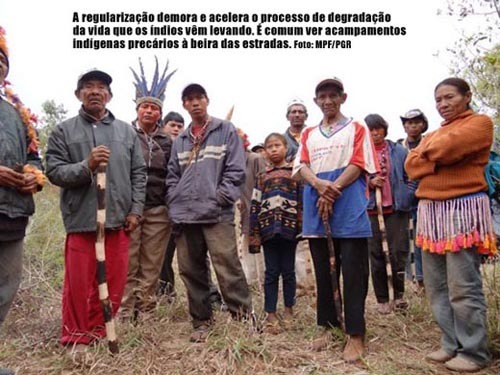 We understand clearly that this decision of the Federal Court of Navaraí-MS is part of the action of genocide and historical extermination of indigenous people, native of Mato Grosso do Sul, ie, the action itself of the Federal Court is violating and exterminating our lives. We want to make clear to the Government and the Federal Court that finally, we have already lost the hope to survive with dignity and without violence in our old territory, we no longer believe in the Brazilian Justice. To whom will we denounce the violence committed against our lives? To which Justice of Brazil? If the Federal Court itself is generating and fueling violence against us. We have evaluated our current situation and conclude that we will all die very soon, and we do not have nor have the prospect of a dignified and fair both here on the riverbank as far from here. We camped here 50 meters from the riverside where already there were four deaths, two by suicide and two due to beating and torture of gunmen’s farmers. We live on the riverside Hovy for over a year and we are without any assistance, isolated, surrounded by gunmen and we resisted until today. We eat food once a day. We pass through all this to recover our old territory Pyleito Kue/Mbarakay. In fact, we know very well that at the heart of our ancient territory are buried several of our grandfathers, grandmothers and great-grandparents, there are the cemeteries of all our ancestors. Aware of this historical fact, we are about and we want to be dead and buried with our ancestors right here where we are today, so we ask the Government and the Federal Court not to order the eviction / expulsion, but we ask to them enact our death collectively and to bury us all here. Please, once and for all, do declare our total decimation and extinction, besides sending several tractors to dig a big hole to throw and bury our bodies. This is our request to federal judges. We now await the decision of the Federal Court. Declare our collective death of Guarani and Kaiowá of Pyelito Kue/Mbarakay and bury us here. Since we fully decided to don’t leave here alive or dead. We know that we have more chance to survive with dignity here in our old territory, we already suffered a lot and we are all massacred and dying apace. We know that we will be expelled from the riverbank by the Federal Justice Department, but let's not get out of the river. As an indigenous people and indigenous history, we decided collectively merely being killed here. We have no choice, this is our last unanimous decision before the dispatch of the Federal Court of Navaraí, MS, Brazil. Was ist hier los?Seit 2012 ist das bekannt und niemand schreibt auch nur ein Kommentar dazu?